Celebrating the life of Robert M. Hick, Jr.
Obituary for Robert M. Hick, Jr.
Robert (Bob) Milton Hick, Jr, 85, of Springfield, PA passed away on March 24th 2018 at Paoli Hospital with his daughters by his side. Born April 19th, 1932 in Middletown, Connecticut he was the only child of Robert Milton Hick and Marion (Strong) Hick. 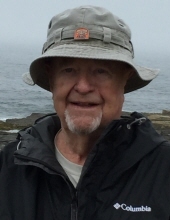 He spent his childhood in Oneonta, NY and in 1954, graduated with dual degrees from SUNY College of Environmental Science & Forestry and Syracuse University where he was a member of Sigma Chi Fraternity and the Men’s Crew Team. Bob served in the US Army as a Corporal and after training at Fort Bliss, TX, served two years of active duty in Mannheim, West Germany and another 4 years in the Army Reserves. He returned to SUNY ESF and Syracuse University where he received his Master’s Degrees in 1958. In July 1959, he married Nancy (Kenney) Hick who predeceased him in July 1996. Bob worked for E.I. DuPont de Nemours Company for more than 40 years. He began as a Chemist at the Marshall Laboratory in Philadelphia before transitioning to an International Marketing Manager in their Automotive Refinish Division in Wilmington, DE. His career afforded him the opportunity to travel the world and create memories for his family through his love of photography. Bob was a very active and devoted member of Covenant United Methodist Church in Springfield for over 50 years. He also served the Township of Springfield through the Shade Tree Commission and had previously been named Citizen of the Year in honor of his long tenured service. He was a dedicated supporter of the scholarship program at SUNY ESF and loyal donor to the Syracuse University’s Men’s Crew program. He spent over 55 summers in North Bridgton, Maine where he enjoyed the peace and tranquility of his lakeside camp. Bob leaves behind a legacy of strength, humility and kindness. He is survived by his two daughters: Susan (Daniel) Little of West Chester, PA and Barbara (Joseph) Questa of Allegany, NY. He is also survived by three grandchildren: Charlotte Little, Santana Questa, and Michael Questa. He is also survived by his sister-in-law Barbara (Robert) Fortenbaugh of Arlington, TX and a niece and nephew also of Texas. Friends and family are invited to a Memorial Service to celebrate his life on Wednesday April 4, 2018 at 7:00 p.m. at Covenant United Methodist Church, 212 W. Springfield Road, Springfield, PA 19064. There will be a Calling Hour from 6:00 – 7:00 p.m. in Wesley Hall immediately preceding the service. Interment will be in Oakwood Cemetery in Syracuse, NY at the convenience of the family. In lieu of flowers, memorial gifts may be made to the Scholarship Fund at SUNY College of Environmental Science & Forestry, ESF Development Office, 1 Forestry Drive, Syracuse, NY 13210 or the Memorial Fund at Covenant United Methodist Church in Springfield. To send flowers or a remembrance gift to the family of Robert M. Hick, Jr., please visit our Tribute Store. "Email Address" would like to share the life celebration of Robert M. Hick, Jr.. Click on the "link" to go to share a favorite memory or leave a condolence message for the family.